A dentist who makes chocolates. 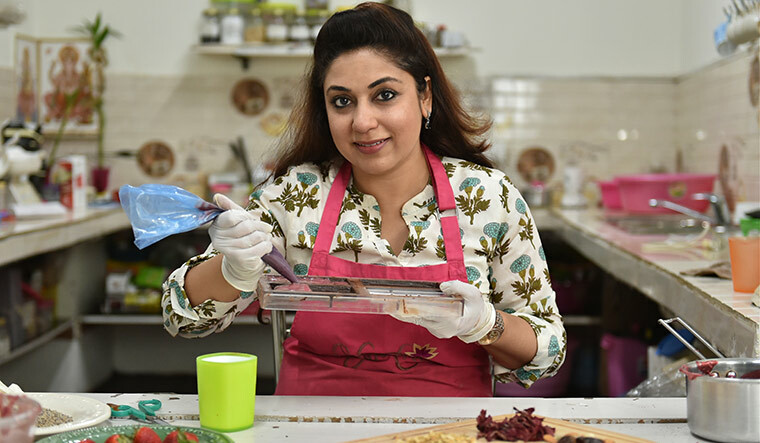 Meet Pragati Sawhney of Chockriti Chocolates. The aroma of dried flowers and herbs perfume her kitchen. There is the scent of jasmine, rose and lavender in the air... of vanilla, betel leaves and strawberries, too. She entered the chocolate business because she felt unhealthy ingredients were ruling the day. Her workspace in Gurugram is a rented L-shaped room, which looks like any regular kitchen at a glance. What sets it apart are the thermometers, moulds, pans and spatulas in varied sizes. To get the right flavours, Sawhney has worked with several materials and now serves over 45 flavours such as African rooibos tea, lavender, matcha green tea, shiitake mushroom, hojicha tea, wasabi, zataar, orange blossom tea and date rose. Indian flavours include Banaras paan, lemon grass, basil, and mithai flavours such as kaju kulfi, thandai, motichur laddu, gujia and gajak. The mithai flavours have bits of the namesake sweet added to the chocolate. 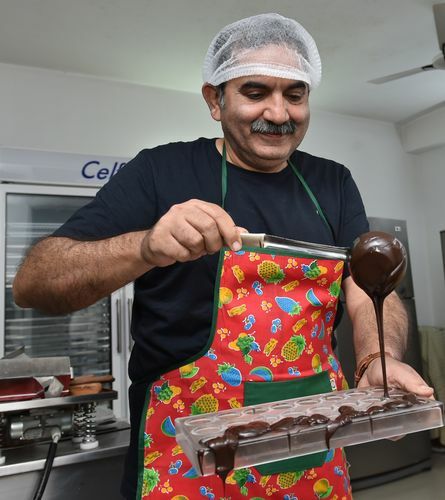 Sawhney is not the only one to explore the world of handmade chocolates. 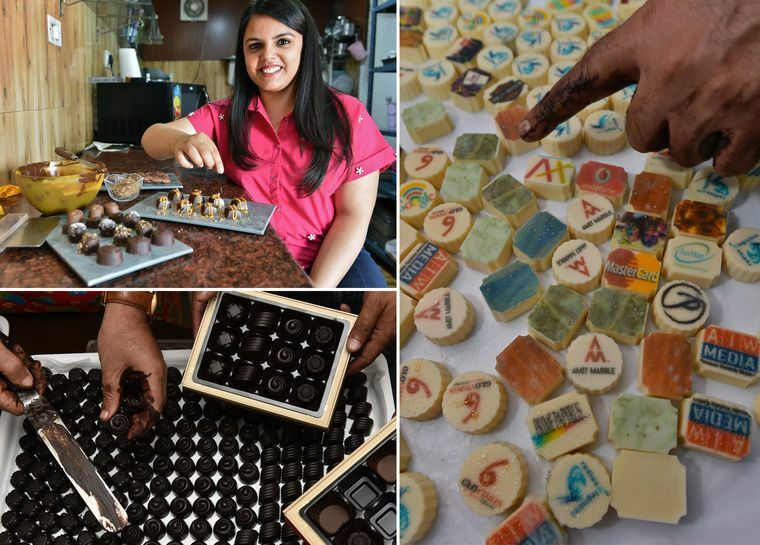 Radhika Gulati, a chocolatier from New Delhi, uses 100 per cent Belgian chocolates and fuses them with almond and caramel. Her signature chocolates have a ganache of almond, pure caramel and vanilla ivory resting between creamy layers of dark chocolate. The 24-year-old Delhiite had interned with a chocolatier in England, while she was an exchange-programme student pursuing a business management course. There she learned how to use different flavours such as strawberry, chocolate, coffee and nuts. After graduating, she got a corporate job, but continued making chocolates on weekends. Thanks to support from friends and family, she started Rosarté Chocolate in 2016, and there has been no looking back. Gulati operates from a small kitchen on the second floor of her house in Shanti Niketan, New Delhi. Along with Belgian chocolates, Rosarté offers vegan and liqueur chocolates, too. Gulati uses only single-origin cocoa from Java, Madagascar and Ghana. “The pure dark chocolate truffle is hand-rolled, and the ganache is made using natural flavours where the truffle is rolled in dark chocolate cocoa powder,” she says. In liqueur chocolates, she amalgamates the liqueur in the prepared batter, instead of infusing it between the layers of the chocolate. Gitana Singh, founder of Cocoa Bark Series, makes customised chocolates by blending couverture chocolates with different ingredients. Singh is not a full-time chocolatier, as she runs a bakery, too. However, she understands the demand for chocolates, and, therefore, customises her bouquet. Her curated pieces allow customers to choose between flavours to go along with their choice of chocolates—dark, white, milk and sugar-free. She offers 40 flavours including apple flakes, dried cinnamon, gin and tonic, mild wine, nutmeg, sea salt, orange creme, lemon, lavender bar, red peppercorns, marshmallows and caramel, raisins, butterscotch and peppermint. In Gurugram, childhood friends Vikas Kuthiala and Praveen Grover quit their jobs to start Parriez. They specialise in cauldron chocolates, presented as soft-centred pralines and truffles. Their chocolates are available in 20 flavours including chillies, cherry, blueberry, coffee, vanilla, strawberry, pineapple, rose and mint. They use flavoured essences to hit the right note. Parriez offers sugar-free and vegan chocolates, too. Customised chocolates with imprints of brand names, logos or even profile pictures are available. Their oil-based chocolates are made with dark chocolate and flavoured essences. “For us, the venture is like reliving our childhood,” says Grover.